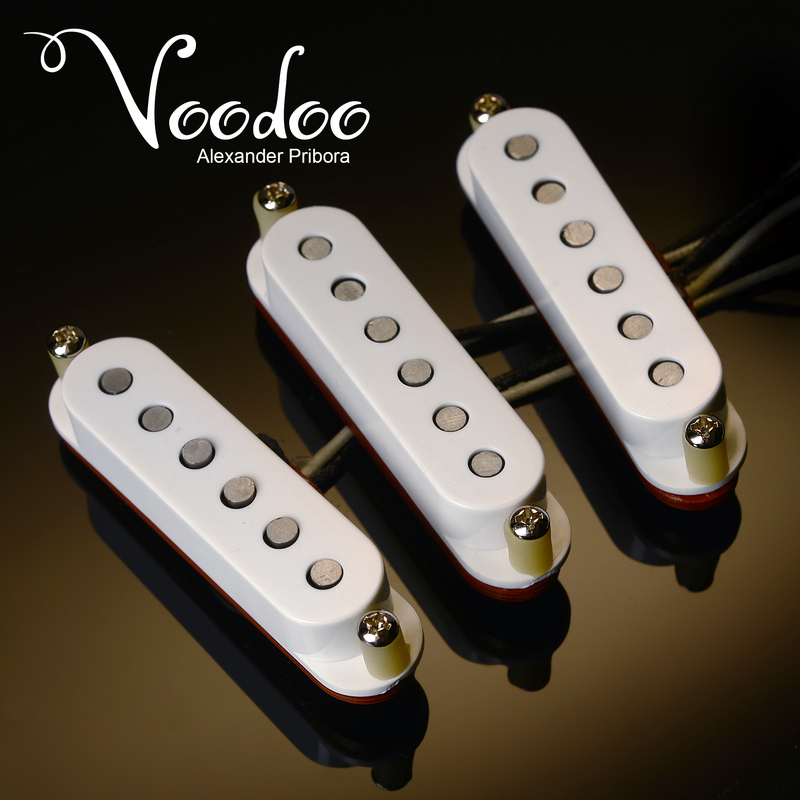 The video shows the test Alexander Pribora Voodoo Pickups. 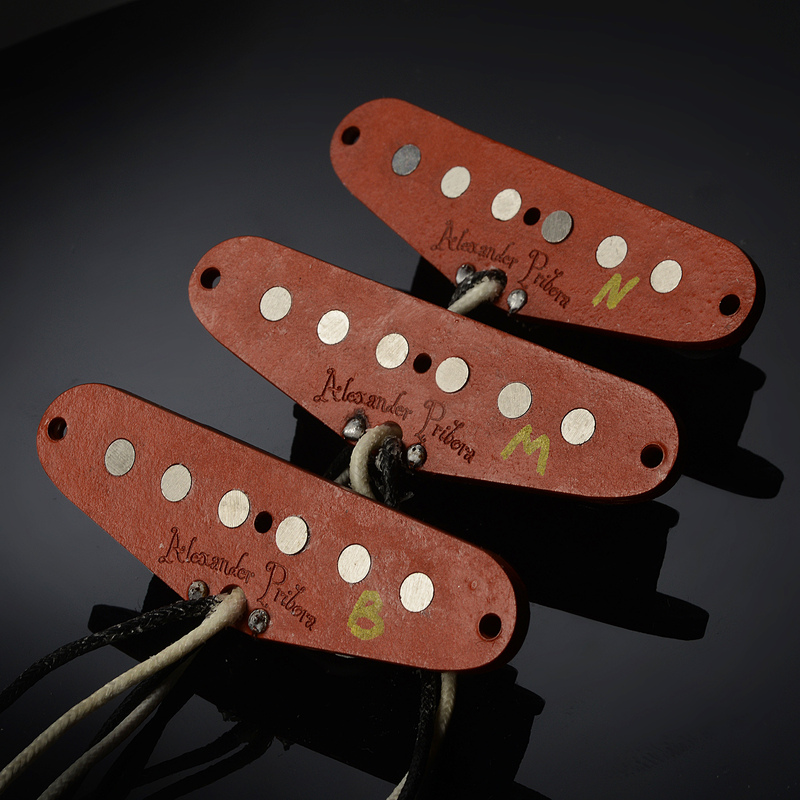 These pickups have a slightly brighter sound in the middle range. I arrived capsules, install and probe, are excellent sound quality for money. Great job. I would like to try a Red and White later. I got the Voodoo pups from a friend and installed them in my custom build,and could not be more pleased.they are articulate,toneful,and very responsive to different picking styles. the sustain is great and you can really hear the space between the notes. I can’t hardly believe the value. Bought the Voodoo set from this online store and received them in about 2 1/2 weeks (Seattle Area USA). The pups were well packed and the package had a tracking number. I put the pickups in a SX Rondo Strat China clone and the pickups are vastly better by a factor of 100. I hear every note (even the bad ones) instead of the mumbo jumbo mess from the stock pickups. Like another reviewer said, I too can hear the space between the notes. I’m very pleased with the quality of build, the tonal qualities both raw and with pedals, and the overall sale that I’m planning to buy another set for a build I’m planning. I’m thinking the traditional set this time. I’m a luthier building custom guitars. I decided to give the Voodoo set a try as I wanted to get away from the big name mass produced pickups and try some custom hand wounds. Very happy I chose this set, very articulate and pronounced, excellent tone qualities. I’ll be trying more from this winder for sure. Just installed these in my strat, the detail of the sound is amazing, wonderful crispness and sparkle, woody stratty clunk when digging into the strings, clean up wonderfully when rolled back through a valve amp. Thank you Alexander amazing job! Excellent pickups… need to buy another strat just so I can get another set of voodoos!!! In March 2018 I’ve bought a set of Voodoo pickups instead of maxon pickups. Installed on Greco “Gneco” Strat 70-ies MIJ. The sound was wider, fuller and much richer. There was a wonderful middle in the sound range with a little hoarse (I thought so). At high frequencies the glass appeared, not the squeal. At low frequencies there was a very legible, deep, rich sound. Sounds great on clean and on overdrive. Deep and hot Blues rock! Guitar sounded much more expensive than it worths ^) Ordered another set on a MIM Strat! This price is very profitable for the real Custom shops pickups. The quality of the assembling and the materials is really high! Thank you, Alexander! Hi, i play with Seymour Duncan in my strat’s about 10 years…I bought a Voodoo pickup set and the sound is AMAZING!!!!!!!! Great tone!!! Thanks a lot PRIBORA!!! VOODOO GUITAR SET IS AMAZING!!!!! Thanks Alexander!! !